The Holy Grail Max provides four carefully crafted reverbs: Spring, Hall, Plate and Reverse. A newly designed analog wet/dry control yields a constant volume curve as the Blend knob is turned from fully dry to fully wet, while also keeping the dry signal analog through the pedal. The pedal's left side features the Holy Grail Max's controls and independent footswitch while the right side is dedicated to the Soul Food's controls and footswitch. A toggle effect-order switch, located in the middle of the Turnip Greens, selects whether the overdrive or reverb is first in the effects chain. Send and Return jacks let the player insert effects into the signal path between the two. With the switch to the right the signal chain is Soul Food â€ ’ Holy Grail Max which produces a traditional sound familiar to most players. In the left position the signal chain is Holy Grail Max and Soul Food. Now the reverb is boosted by the overdrive which, when used in conjunction with pedals in the effects loop, can create very lush textures. 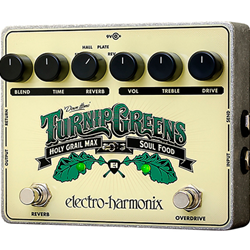 The new Turnip Greens multi-effect pedal combines two of EHX's hottest-selling products, the transparent Soul Food overdrive and lush Holy Grail Max reverb. Beyond simply combining these two great products, we've added additional features to make the pair even more potent!